Whether your style is vintage, modern or classic, we have the perfect stationery for you – and if not we can customize it and make your vision come to life on paper. 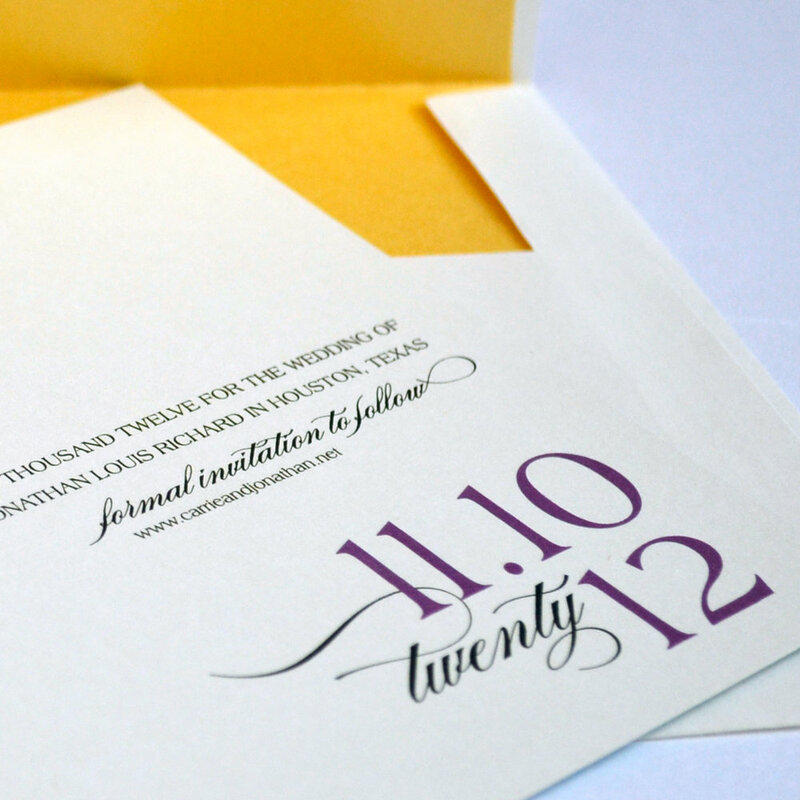 We offer a variety of invitations that are pre-designed, and ready for your wording and details. If it’s not exactly what you’re looking for, we can change minor things such as text color, fonts, paper color, add foil, embellishments, and more. But if you can’t find the perfect fit simply send us a message because we love to create custom, one-of-a-kind designs! We can combine various ideas, create something you already envision, or bring some ideas if you’re not sure where to begin. We recommend an initial consult be 6-8 months before your wedding day. The consult may over the phone, via email or in person if you live locally. We'll talk about your likes and dislikes and everything from papers to colors, fonts to graphics, number of pieces and more. After the consult, we will develop a quote based upon our discussions for your approval. Custom design pricing is as individual as the designs themselves. Upon acceptance of the quote, a contract will be sent which will detail due dates. We require a 50% deposit for the order based on the quote. We will start designing about 4-6 months before your wedding. 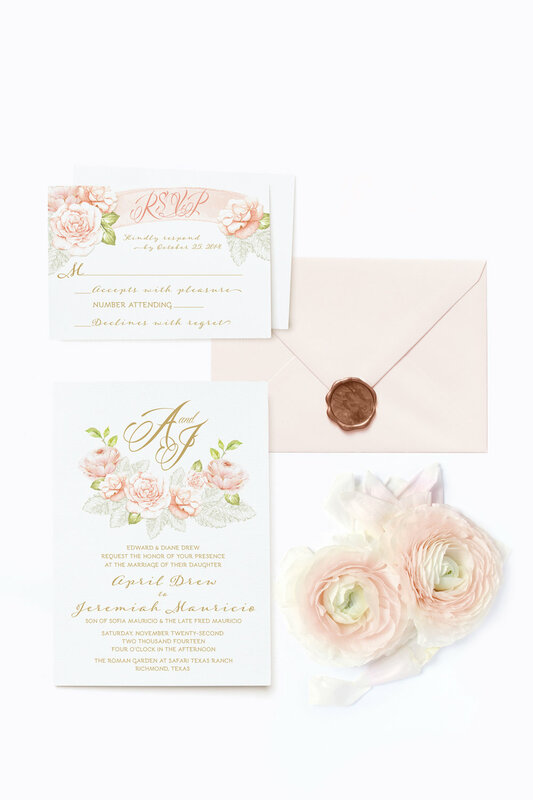 All of your wording for the invitation and inserts should be finalized before the design process begins. We’ll take everything discussed from the consultation into consideration and create 2-3 designs of an invitation only for your review. After you provide initial feedback on which design you prefer, we will design the remaining pieces discussed at our consultation. During the design process, we send you proofs in PDF format. You should review them carefully and with anyone who may be involved in the decision making process. Proofing is your responsibility and once you approve the final proof in writing, the outstanding balance will be due. Once final proof and payment are made we will place the complete order, have them printed and assemble any pieces if needed. You can pick up the finished product at my home studio or I can ship it to you. Please keep in mind when planning on custom invites the production process takes 4-6 weeks from when you sign the final proof and I receive payment. It is customary to mail wedding invitations 6-8 weeks before the wedding date. You may want to mail as early as 10-12 weeks ahead for a destination wedding. Rush orders can possibly be accommodated, so please inquire and I will let you know if I can be of help to you.